Unit test coverage is pretty good, but unfortunately we can not add behat tests as all this depends on external software so we need some manual testing. 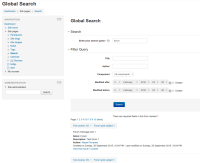 Return to reports -> search browser tab and tick 'Delete' checkbox, 'Entire index' should be selected already, press "Save changes"
Global Search is currently removed from Moodle 2.2. As part of GSoC '13 project, I've re-written Tomasz Muras's Global Search implementation for the current 2.6 (dev) master branch.